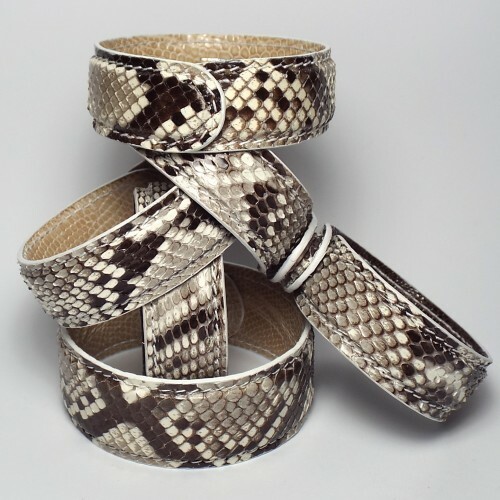 The outside of these bracelets is covered in natural python skin, the inside is lined with lizard leather and is embossed with ‘MMzS’. The bracelet is incredibly easy to open, close and wear as each end of the bracelet has a magnet hidden in between the layers of leather that keeps the bracelet securely in place. 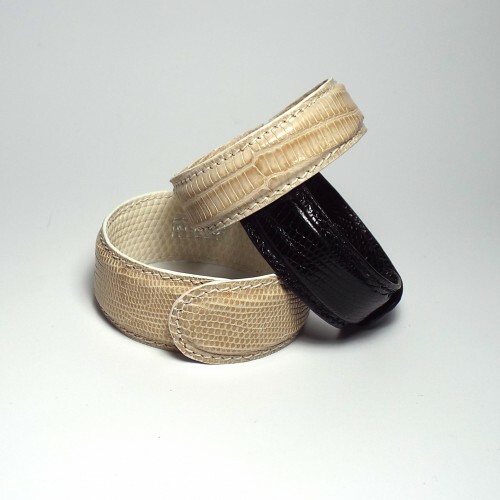 The bracelet comes in two sizes in terms of width and diameter. The narrow ones go very well with a daytime outfit or in the evening as part of a bracelet stack. The wider one is perfect to go with an oversized top – or to accessorise a bikini or linen shirt poolside. Please note that the pattern on each bracelet is different depending on the piece of skin used. Material: outside natural python skin, inside lizard skin. The leather is compliant with the Convention on International Trade in Endangered Species of Wild Fauna and Flora (CITES). Free delivery on any orders in the UK. Standard UK delivery time is 2-3 days for the small bracelet. Please note that the large size is currently out of stock and will take 2-4 weeks for delivery.